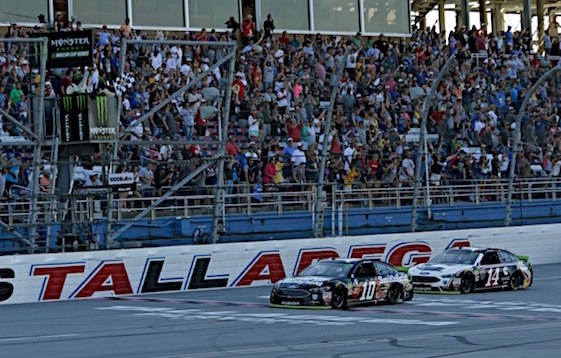 Sunday afternoon’s race at Talladega Superspeedway may have lacked excitement but it did offer one majorly impressive demonstration of team work in the Monster Energy NASACR Cup Series. At the end, Stewart-Haas Racing’s Aric Almirola was the beneficiary as he collected the overtime victory and the automatic berth in the Round of 8 playoffs, which begin after next weekend’s race at Kansas Speedway. The overtime victory was Almirola’s first of the season and capped of a day of military-grade precision by his team. Teammate Clint Bowyer finished second and Rickey Stenhouse Jr. of Roush Fenway Racing was third. Stewart-Haas’s driver foursome of pole-sitter Kurt Busch, Kevin Harvick, Bowyer and Almirola started the race in the top four spots. They stayed that way though stages 1 and 2, winning both (Busch the first and Harvick the second). The final stage saw the four – who spent most of the race using nose-to-tail team work at the 2.66-mile restrictor-plate track – challenged. A caution with 29 laps to go set up a restart and a chance to split up the SHR foursome. But the Stewart-Haas drivers orchestrated themselves to nose to tail at the front of the preferred inside line. For the next 26 laps they pulled away from the rest of the field. But with three laps to go, out came a caution to set up an overtime finish and another restart. Before that restart, Harvick, who had led 46 laps, had to pit for fuel. Busch, who led 108 laps, was in the lead but then he ran out of fuel on the final lap. Busch called BS on NASCAR officials for their late-race calls. But with Busch and Harvick out of contention, it was left it up to Almirola and he came through bigly. Sunday’s race was the second in the three-race Round of 12 in the playoffs. The field of drivers eligible to win the 2018 championship will be cut down to eight following next weekend’s event at Kansas Speedway. 1. (4) Aric Almirola (P), Ford, 193. 2. (2) Clint Bowyer (P), Ford, 193. 3. (12) Ricky Stenhouse Jr., Ford, 193. 4. (10) Denny Hamlin, Toyota, 193. 5. (20) Joey Logano (P), Ford, 193. 6. (23) AJ Allmendinger, Chevrolet, 193. 7. (6) Jimmie Johnson, Chevrolet, 193. 8. (15) Erik Jones, Toyota, 193. 9. (30) Paul Menard, Ford, 193. 10. (25) Regan Smith, Chevrolet, 193. 11. (34) Kyle Larson (P), Chevrolet, 193. 12. (28) * Brendan Gaughan(i), Chevrolet, 193. 13. (24) Trevor Bayne, Ford, 193. 14. (1) Kurt Busch (P), Ford, 193. 15. (29) Ty Dillon, Chevrolet, 193. 16. (13) Daniel Suarez, Toyota, 193. 17. (21) Austin Dillon, Chevrolet, 193. 18. (37) Joey Gase(i), Chevrolet, 193. 19. (17) Darrell Wallace Jr. #, Chevrolet, 193. 20. (8) William Byron #, Chevrolet, 193. 21. (26) Chris Buescher, Chevrolet, 193. 22. (38) * Landon Cassill(i), Chevrolet, 193. 23. (11) Martin Truex Jr. (P), Toyota, 193. 24. (36) Ross Chastain(i), Chevrolet, 193. 25. (22) Ryan Newman, Chevrolet, 193. 26. (9) Kyle Busch (P), Toyota, 193. 27. (18) Brad Keselowski (P), Ford, 193. 28. (3) Kevin Harvick (P), Ford, 193. 29. (19) Ryan Blaney (P), Ford, 193. 30. (27) Matt DiBenedetto, Ford, 192. 31. (5) Chase Elliott (P), Chevrolet, 192. 32. (40) Corey LaJoie, Chevrolet, 191. 33. (7) Alex Bowman (P), Chevrolet, 191. 34. (33) * DJ Kennington(i), Chevrolet, 190. 35. (31) Jamie McMurray, Chevrolet, 186. 36. (32) JJ Yeley(i), Ford, Accident, 185. 37. (35) * Jeffrey Earnhardt, Toyota, 185. 38. (39) Cody Ware, Chevrolet, 185. 39. (16) David Ragan, Ford, 173. 40. (14) Michael McDowell, Ford, 155. Average Speed of Race Winner: 153.707 mph. Time of Race: 03 Hrs, 20 Mins, 24 Secs. Margin of Victory: 0.105 Seconds. Caution Flags: 8 for 32 laps. Lead Changes: 15 among 11 drivers. Lap Leaders: Kurt Busch (P) 1-11; A. Allmendinger 12; Kurt Busch (P) 13-56; M. DiBenedetto 57; R. Blaney (P) 58-63; R. Chastain(i) 64; K. Harvick (P) 65-68; Kyle Busch (P) 69; K. Harvick (P) 70-111; B. Keselowski (P) 112-121; W. Byron # 122-126; B. Keselowski (P) 127-137; M. DiBenedetto 138; B. Gaughan(i) 139; Kurt Busch (P) 140-192; A. Almirola (P) 193;. Leaders Summary (Driver, Times Lead, Laps Led): Kurt Busch (P) 3 times for 108 laps; K. Harvick (P) 2 times for 46 laps; B. Keselowski (P) 2 times for 21 laps; R. Blaney (P) 1 time for 6 laps; W. Byron # 1 time for 5 laps; M. DiBenedetto 2 times for 2 laps; R. Chastain(i) 1 time for 1 lap; Kyle Busch (P) 1 time for 1 lap; A. Almirola (P) 1 time for 1 lap; A. Allmendinger 1 time for 1 lap; B. Gaughan(i) 1 time for 1 lap.